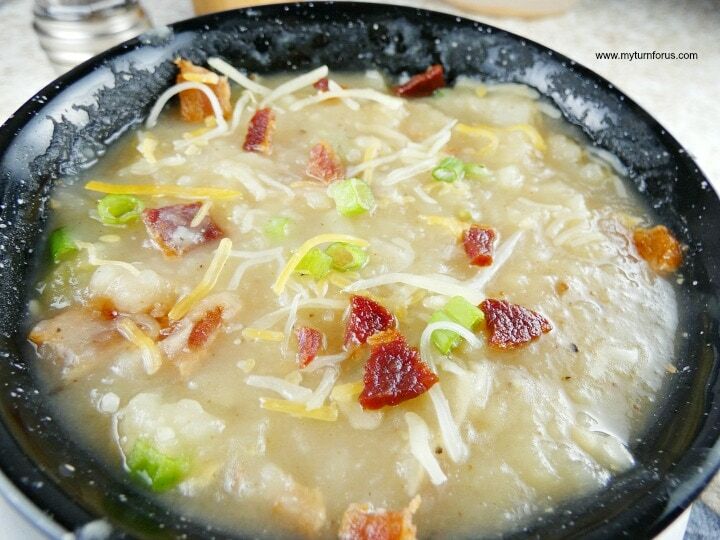 Our Amish potato soup makes a chunky potato soup topped with cheese, chives, and bacon. It’s a family old fashioned potato soup recipe. If you are looking for an old fashioned potato soup recipe you have come to the right place. 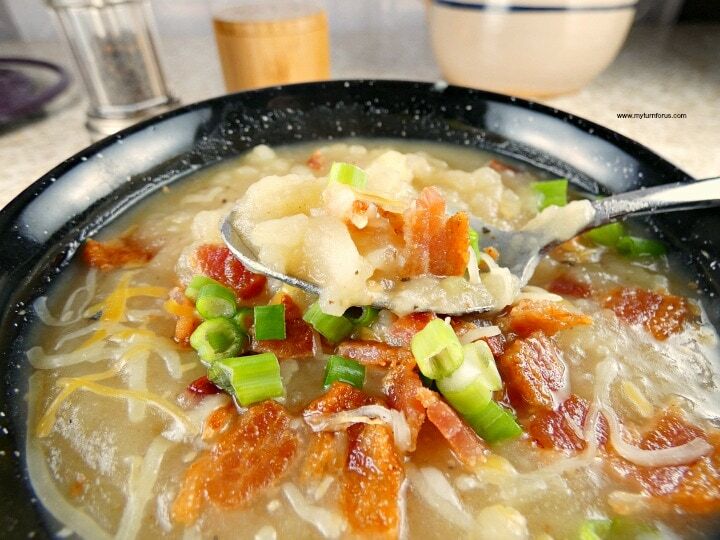 Uncle Carl’s Amish potato soup is loaded with bacon flavor because of a couple little secrets in the cooking process. My uncle Carl is an amazing cook! He lives by himself and enjoys cooking for everyone. He gave me his recipe for Amish Potato soup about 10 years ago. This chunky potato soup is my all-time favorite, go-to comfort food. And he happens to be, my all-time favorite Uncle. 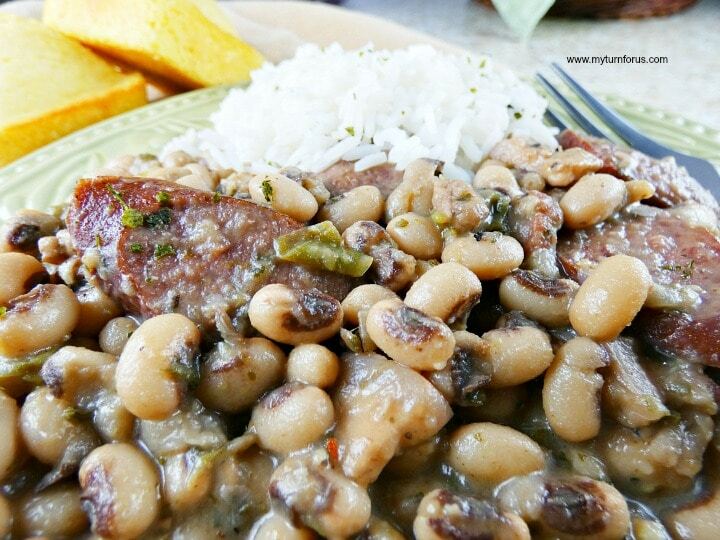 By the Way, my Uncle Carl is king in his kitchen, you don’t ever stir his beans, season his dishes nor wash his dishes (no challenge here). Love him!! 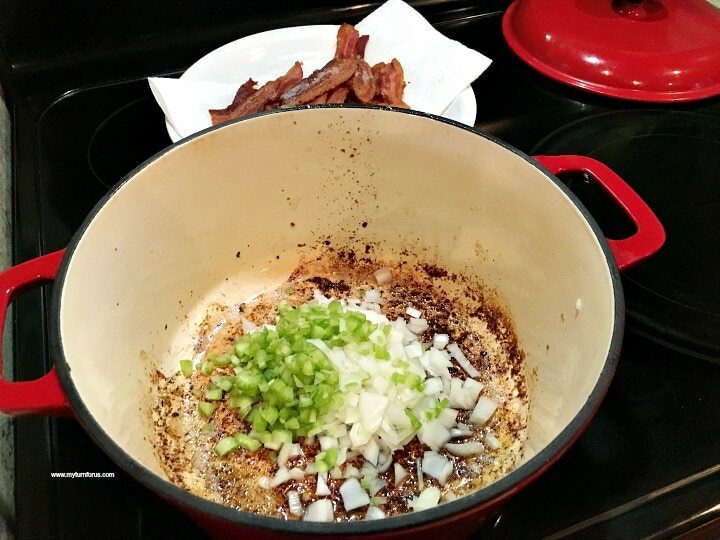 Start your potato soup by frying 8 slices of bacon in a dutch oven. Remove bacon and place on a paper towel lined plate to drain. Drain off all by about 2 tablespoons of the bacon grease. 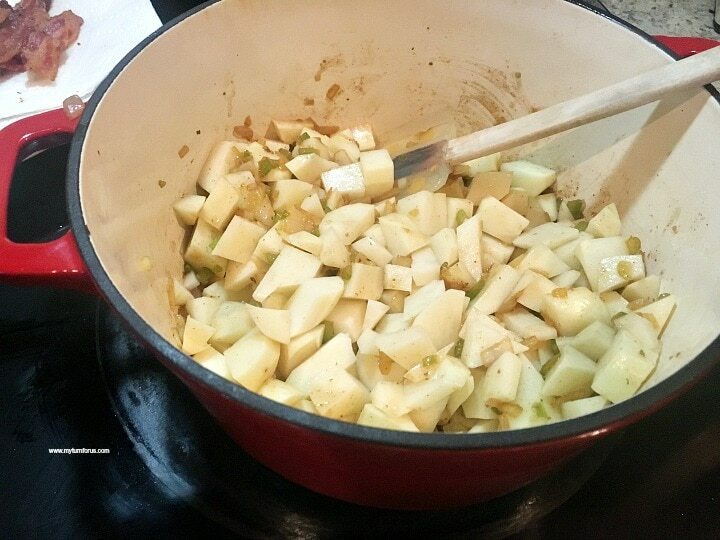 Add the chopped celery and onions and stir around among the browned bits. 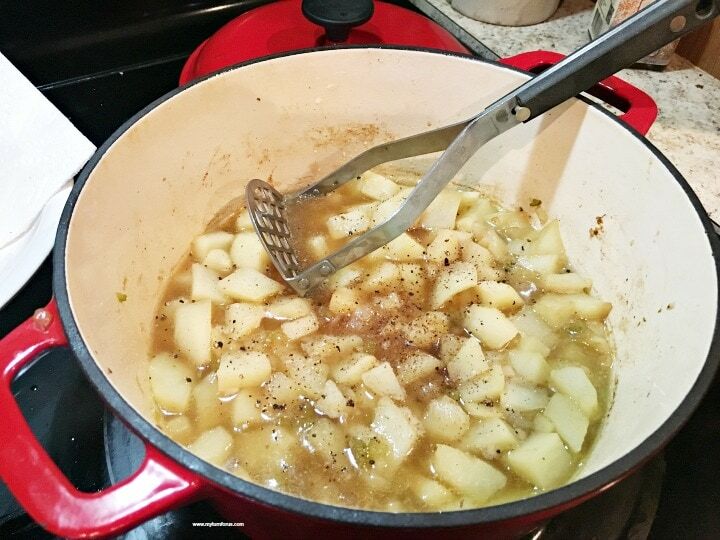 This brown remnants of the bacon add an amazing flavor to this Amish Potato Soup. Cook the celery and onions until soft and onions are translucent. See how it gathered up all that brown bacon flavor? That’s what makes this chunky potato soup amazing. That’s why we cook the soup in the same pot as the bacon to not waste all that amazing flavor. Add the potatoes to the dutch oven and stir to combine the veggies thoughout. 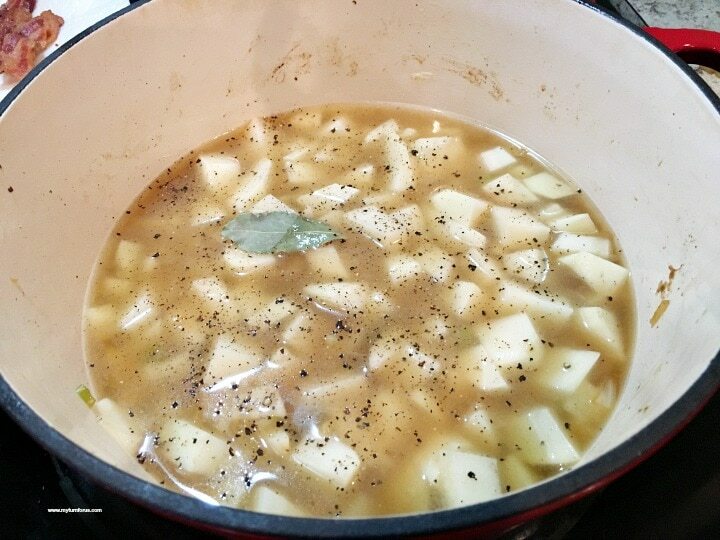 Add 2 and 1/2 cups of water and bay leaf and cook on medium-high heat until the potatoes are tender. See how rich this broth is? Add a little freshly grated nutmeg and Worchester sauce. 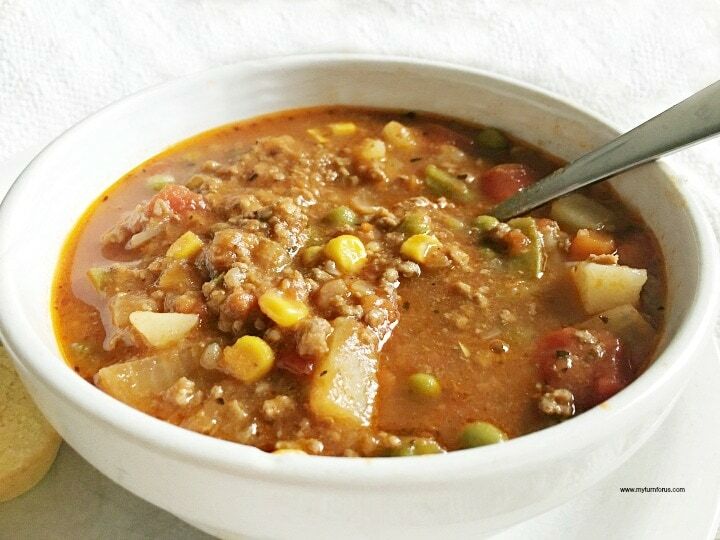 At one time I made this soup using an immersible blender but no more. You need to use a potato masher to make this a Chunky Potato Soup. Do not pour off all the delicious broth, mash the potatoes right in the dutch oven, retaining all the flavor. You can add a little milk if needed but normally we don’t. Your chunky potato soup should be bite-size pieces of potatoes, not huge chunks nor completely mashed potatoes. 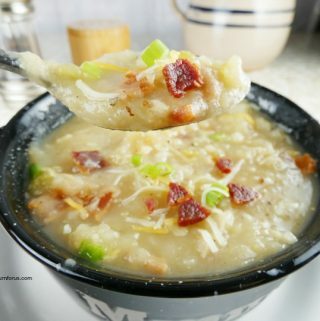 Serve topped with chopped bacon, chives or green onions and grated cheese. 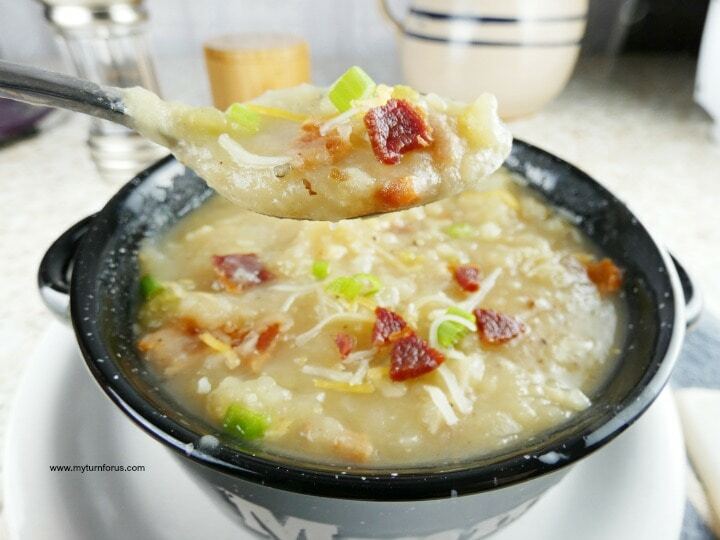 A chunky potato soup seasoned with bacon flavors and celery and onions. Remove bacon and place on a paper towel lined plate. Chop or crumble into bite-size pieces. Add potatoes stir and then add water, bay leaves and salt and black pepper. Boil over medium-high heat until potatoes are tender. 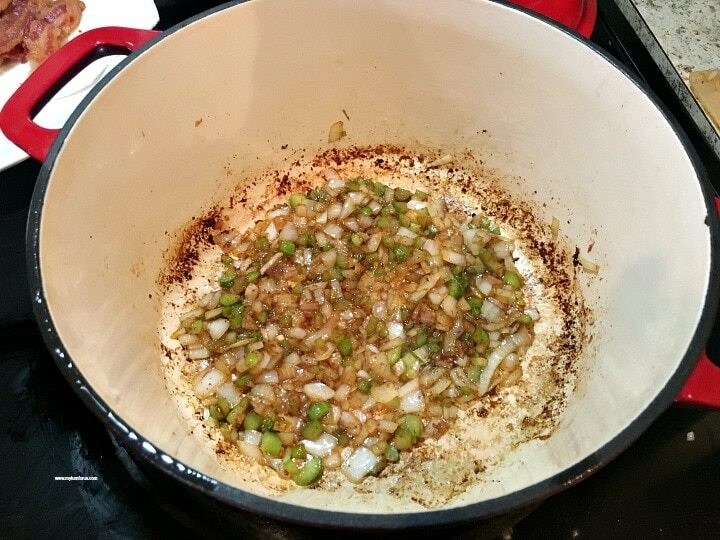 Remove bay leaves and add a splash of Worcestershire sauce, a pinch of nutmeg. Using a potato masher, mash the potatoes in the broth leaving them chunky. Add salt and pepper if needed. Milk can be added if the consistency is not to your liking. Serve with the chopped bacon, grated cheddar cheese, and fresh chives or green onions sprinkled on top. 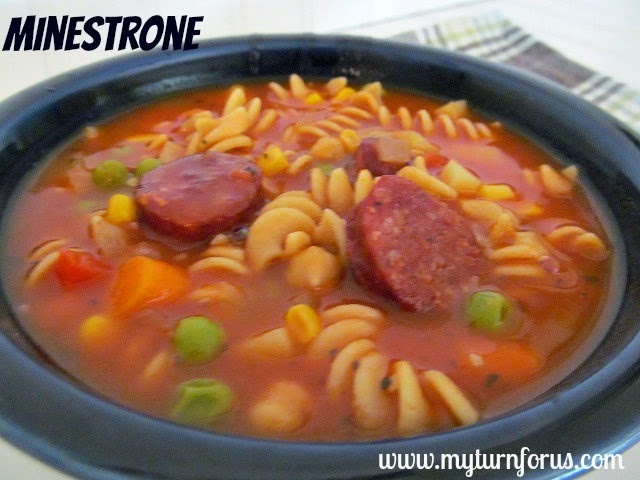 Oh…this is soup time of year and this one looks so good! That’s exactly what I’m looking for in my Link Party that just opened a few minutes ago. This week on Future Expat’s Required Ingredient Link Party, we are featuring potato recipes. I hope you’ll come link up this one and any others you think others will like! This sounds so perfect for those cooler nights!